The KDE community now has multiple release tracks for their software. It used to be just the monthly incrementals to the KDE Software Compilation, but part of the transition to Qt5, QML and the new Frameworks, this monolithic release schedule has been abandoned. The Frameworks 5 (successor of kdelibs) and Plasma 5 release schedules are now pretty much disconnected. The new release schedule can be found here for Frameworks 5 and Plasma 5. This complicates things quite a bit for the planning of my Slackware packages. I do not want to get obsessed with providing these packages the day their source code is released. That will be unmanagable at a personal level. So, during the past week I have been sitting on Slackware package sets for KDE 4.14.1, Frameworks 5.2.0 and Plasma 5.0.2. I have decided not to release these package sets one by one but instead I waited until all three of these were publicly announced to the world. Willy Sudiarto Raharjo tested these packages and he provided valuable feedback on the packages as well as my documentation – thanks again, Willy. Today, the packages have been made available on my ‘ktown‘ repository and you can grab them! None of the dependencies for KDE 4 and 5 had to be upgraded since the release of the previous KDE 4 and 5 package sets. The KDE 4.14.1 package set uses the sources of kactivities-4.13.3 (taken from the KDE 4.13 major release) because no new tarball is being made available. For kde-workspace, an update to 4.11.12 was provided. What to expect from these new packages ? The KDE 4.14.1 is the first increment of the 4.14 release cycle. It focuses on bug fixing, not feature enhancements. A list of changes is found here. Frameworks 5.2.0 is also a bug fix release. The Frameworks have been in development for a long time and are pretty stable. Plasma 5 software is much younger, and that shows. The release of Plasma 5.0.2 is an ongoing process of fixing annoying bugs. The 5.1.0 release in October will finally see some new functionality – several programs that are part of Plasma 5 have reduced functionality compared to their KDE4 predecessors. My previous post on Plasma 5 for Slackware has a lot of additional information, tips, known issues and such. You might want to (re-)read it. How to upgrade to KDE 4.14.1 ? How to upgrade to KDE 5 (frameworks & plasma) ? If you want to try out KDE 5 (Frameworks & Plasma) please be warned that KDE5 is incomplete. 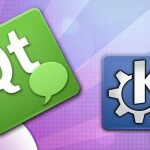 Lots of programs still have to be ported to Qt5 and QML, and therefore your new KDE5 desktop will heavily rely on the availability of KDE4 programs. You need to have already installed my KDE 4.14.1 packages with dependencies, before you install/upgrade to the Frameworks 5 / Plasma 5 packages and their dependencies. Not the other way round please! Some dependencies for KDE5 need to overwrite stuff of the KDE4 dependencies. I provide a README file for KDE5 as well. Read it carefully! Once you have installed these packages you can run “xwmconfig” and select “xinitrc.plasma” (if you are in runlevel 3) before running “startx”. If you are in runlevel 4 (graphical login session manager) you should select “KDE Plasma 5” from the KDM session dropdown. You can also use SDDM, a new graphical login manager, which will have been installed as part of the KDE5 packages, but you need to do some editing of “/etc/rc.d/rc.4” to enable SDDM. See my previous post on Plasma 5 for more details. You will find the KDE 4.14.1 sources in ./source/4.14.1/ and packages in /current/4.14.1/ subdirectories, whereas KDE 5 (Frameworks 5 and Plasma 5) sources can be downloaded from ./source/5/ and packages from /current/5/ . Note that I have symlinks in place (useful for users of a package manager and running slackware-current) so that ./current/latest/ will always point to the latest stable KDE release, and ./current/testing/ will always point to the most recent testing release (currently that’s Frameworks 5 and Plasma 5). Perhaps you noticed the directory name for KDE5 is “5” and not “5.0.2” or “5.2.0”. I decided to treat KDE5 as a “rolling release” and in future will probably update parts of it. For instance, when a new Frameworks 5 is released, I will only update the sources in ./source/5/kde/src/frameworks/ and the packages in ./current/5/*/kde/frameworks/ . The toplevel directory name will stay at “5”. Posted: 18 September, 2014 in Slackware, Software. Any updates on the ARM port? But is it possible to install 5 and still use 4.14.1 ? Hi, I noticed that if you want reach the 14.1 package through /mirrors/alien-kde/14.1/latest/x86 the version is 4.13.3. This one, in my case, doesn’t work fine, the windows can’t load the close, min and max buttons, so you can’t close them. But if you go to /mirrors/alien-kde/current/4.14.1/x86/kde you reach the 4.14.1 version and it works ok. Thanks for the packages. The difference between “14/latest/” and “current/latest/” is of course that one contains the latest set of KDE packages for Slackware 14.1 while the other one contains the latest set of KDE packages I have for Slackware-current. That explains the difference in KDE versions. If in KDE 4.13.3 your windows do not have the minimize/maximize/close buttons, your window manager does not seem to start. You could have run this in a terminal window: “kwin –replace” to see if there are any errors when starting the window manager. OK. This latest version was a complete regression for me. Suddenly KDE froze while scp’ing a file and now plasma is completely broken everytime I log in to Plasma5. The menubar is missing and krunner isn’t working. Firefox and konsole are running though..
What can I do to debug this problem and perhaps give some valuable information to the KDE team? Are you going to release the packages for the beta release, Eric? I am not going to release beta packages for a software that is not stable. I would not call it beta, rather alpha. And what’s worse, the KWin developer has based his beta version on unreleased KDE Frameworks code. If you want to try this new Plasma 5 beta, you’ll have to build Frameworks from the git repository sources first. I noticed that you create a .desktop file for qtconfig-qt5 in your qt5 (5.3.1) SlackBuild, but that application is no longer build. So you can remove that desktop file.